The Blue Fox Classic Vibrax features a patented two-part body that emits low-frequency sound vibrations which attract fish of all kinds and trigger strikes. The design of the Classic Vibrax also virtually eliminates line twist. 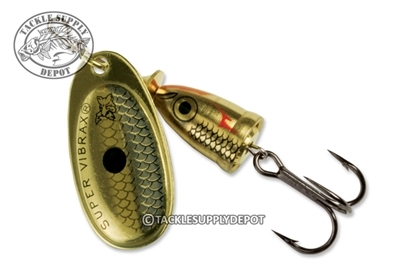 Made from quality components the Blue Fox Classic Vibrax is effective for targeting an array of gamefish but is a true favorite to Trout and Smallmouth anglers. Whether trolling or casting and reeling back with a steady retrieve the Blue Fox Classic Vibrax will produce ideal sound, vibration and flash that draws attention and capitalizes on the predatory instincts of hungry gamefish. Offered in a variety of sizes and most effective in the 2 to 6 foot range. All sizes come ready with an extremely sharp VMC trebly while sizes 3 through 6 also include a proper sized Siwash hook.